★ Iowa County was created October 9, 1829, from Crawford County and named for the Iowa Tribe of Native Americans, who were once part of the Ho-Chunk tribe. 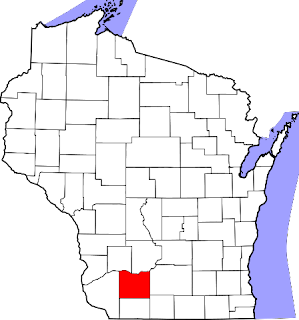 Between 1820 and 1840 they ceded to the U.S. Government their ancestral homelands in what would become Wisconsin and were relocated to Eastern Iowa. ★ Of the village of Hollandale was written on September 7, 1888: “Mercury did not spring from the brain of Jupiter with more power and magical effect than the new, bright, active little inchoate city of Hollandale . . . sprang from a corn field into organized life and form”. ★ The village was first named Bennville (not officially – no documents!) and later was named Hollandale. Both names were for Bjorn Holland (1841-1930), a merchant, teacher, and a Wisconsin state legislator, who settled in the area. July 1903: The Hollandale State Bank of the village of Hollandale filed articles of incorporation with the secretary of state on July 26, 1903. The new institution had a capital stock of $5,000, and was incorporated by Jerome J. Jones, Barneveld; John M. Ruse, Dodgeville; Llewellyn Jones, Barneveld; and George Paulson, Hollandale. March 1920: The Dubuque Telegraph Herald and Times reported on March 12, 1920, that Stephen T. Stanley, former cashier of the Hollandale State Bank, entered a plea of guilty to the charge of forging a $2,000 note on the Blanchardville National Bank. Judge J. B. Simpson gave Stanley a suspended sentence of from one to seven years in the state prison. September 1920: The Mineral Point fire department rushed to Hollandale on September 1, 1920, as the town was reported to be on fire and cut off from communication. The fire started around midnight, and destroyed two stores and one dwelling before it was extinguished about 3:00 a.m. Losses were estimated at $20,000. March 1923: In March 1923 the Farmers’ Co-Operative store, the Hollandale telephone exchange, and a pool hall were destroyed by fire. Losses were estimated at more than $35,000. Summer 1923: The new road in Sandy Rock, under the supervision of Casper Olson, was built in the summer of 1923. July 1927: The Hollandale State Bank re-opened in July 1927 after being shut down for two months due to “frozen assets”. E. L. Severson was the new cashier, a man well known throughout southwestern Wisconsin. The bank was also planning to hire a new bookkeeper. December 1927: Stephen T. Shanley, former president of the Hollandale State Bank, was tried in circuit court on December 13, 1927, on charges of embezzling $1,800. He pleaded guilty to the indictment which charges embezzlement of bank funds. Judge Aldro W. Jenks deferred sentence until January 3, 1928 that Mr. Shanley might spend the Christmas holidays with his family. Judge Jenks eventually imposed an indeterminate sentence of one to five years. October 1928: Employees of Karrmann and McCullough, local highway contractors, were working day and night in October 1928 to spread 15,000 cubic yards of crushed stone nearly 17.5 mile stretch on state highway 39 between New Glarus and Hollandale. The project was one of the largest surfacing jobs in southwest Wisconsin that season. The project was expected to be completed before November 1. Work had been delayed in the spring because of inclement weather. November 1928: Hollandale resident Jim Collins was bound over for trial in circuit court in November 1928 on a charge of “possessing intoxicating liquor”. Collins was arrested after Sheriff Russell Williams and one Robert Hillary, who reported Collins, raided Collins’ property in October. January 1929: Miss Gladys Peterson of Arena and Percival Peterson of Hollandale were to be wed on Saturday, January 5, 1929, at the Crystal theater in Dodgeville, but a “heavy snow storm . . . stalled the bridal party’s car” and the couple had to get married on Sunday instead. April 1929: On April 24, 1929, a fire started at the Brunker farm house about 4:00 p.m., and quickly engulfed the entire home in flames. Mrs. Emme Brunker rushed into the flames to rescue her child, who was sleeping in one of the bedrooms. Both suffered severe burns and were hospitalized. The house was completely destroyed. December 1929: Cousins Arthur (17) and Burl (18) Etherige confessed to a series of robberies when captured by Darlington Deputy Sheriff Clarence Taylor on Monday, December 9, 1929, who found the boys sleeping in a school house near Hollandale. The boys had held up and fired four shots at James Garlach of Shullsburg as he drive on the Blanchardville highway on Sunday afternoon, burglarized Blanchardville five stores on Sunday night, were driving a car stolen from LaSalle, Illinois, and had stolen three other cars in the previous three months. The boys each possessed a .38 calibre revolver at the time they were arrested. They appeared before Iowa County Judge J. S. Simpson on December 10, 1929, and were held over for Illinois authorities. October 1933: On October 8, 1933, the Hollandale Lutheran church marked the 50th anniversary of the founding of the Ladies Aid society and the 40th anniversary of the building of the church. Mrs. Gus Hendrickson was president of the society. Rev. S. Gunderson of Mt. Horeb was present at the dedication of the church in 1893, and spoke at the anniversary celebration. The Hollandale church was established on January 9, 1893, when congregations at the now extinct village of Adamsville and Hollandale were merged, and a church was built in Hollandale. The Ladies Aid society was organized in the farm home of Ambjorn Urness in 1883, and Mrs. Urness was elected the first president. The women met in farm homes for several years, “always starting out their meeting with a substantial noon meal”. Two more ladies aid societies were established over the years. The groups finally merged in June 1924. Besides paying for numerous improvements in the church and contributing to the general budget, the ladies aid has contributed liberally to the Indian mission at Wittenberg and to the Skaalen Home for the Aged and the Martin Luther Children’s home in Stoughton. The anniversary celebration centered “largely around the history of the church”. September 1945: Mrs. Marit Rundhaug travelled to her daughter’s home in Northfield, Minnesota, to celebrate her 90th birthday in September 1945. Mrs. Rundhaug was described as “still” active “despite her advanced years”. November 1948: Hollandale High School pupils were awarded an A rating for their one-act play, “Mooncalf Mugford” at the sectional tournament at Blanchardville the first week of November 1948. They would take their production to the district contest the following week. November 1948: When Mrs. Ingebord Hegland celebrated her 86th birthday on November 15, 1948, she hosted a birthday celebration that included her two children, three granddaughters, and five great-grandchildren. December 1948: Paul Hughes was injured on While driving on icy roads on December 14, 1948, Paul Hughes’ truck skidded off the highway and overturned. He was treated for cuts to his face and arms by Dr. S. Marshall. Hughes’ truck was “badly damaged”. May 1949: On May 2, 1949, the Lutheran men of the Mt. Horeb circuit of the Evangelical Lutheran Church Brotherhoods held on of the largest gatherings of Lutheran men at the Hollandale Lutheran Church. The main speak was Elvin Olson of the Eastern district of the Evangelical Lutheran Church Brotherhood. The Ladies Aid society served the banquet. June 2015: A “powerful train of storms” moved through southwestern Wisconsin the morning of Monday, June 22, 2015. The winds lifted the aluminum bleachers at the Hollandale Rockies’ baseball diamond out of the ballpark and dropped them several hundred feel away on Highway 191. The roads between Hollandale and Dodgeville (some 12 miles to the northwest) were so littered with downed power lines and trees that the fire department needed chain saws to cut through the debris. Hollandale is located in Iowa County. "One of the Midwest's premier art environments"